I have always wanted to make chicken with 40 cloves of garlic. The idea of using that much garlic had me so interested, like the time price ordered Garlic soup and it was AMAZING! 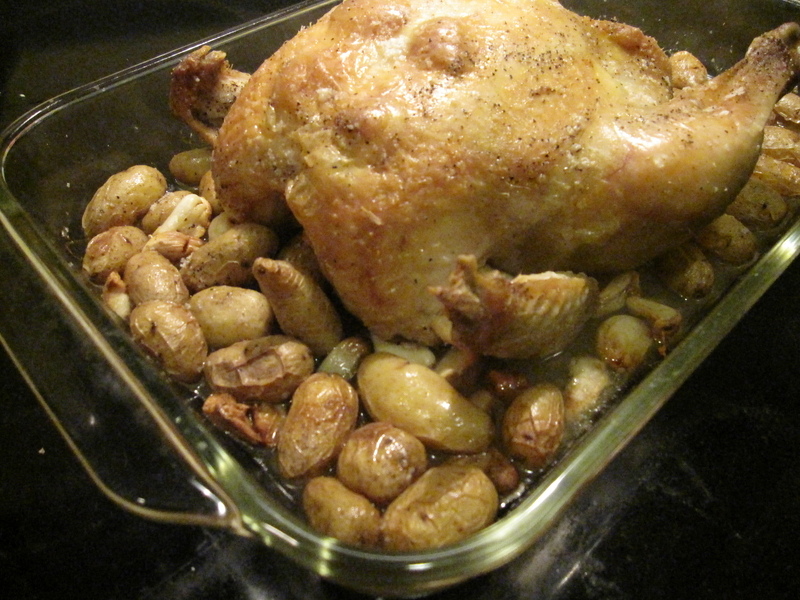 I had seen several recipes for chicken with 40 cloves are garlic but to be honest they seemed like more work than what I wanted to deal with, like chopping up a chicken, dredging it, boiling the garlic, etc. So I opted for creating an easy version by using a whole chicken and roasting it along with the garlic. So this is my reworked version, simple, easy, and delightfully garlicy! This recipe is more like a complete meal. 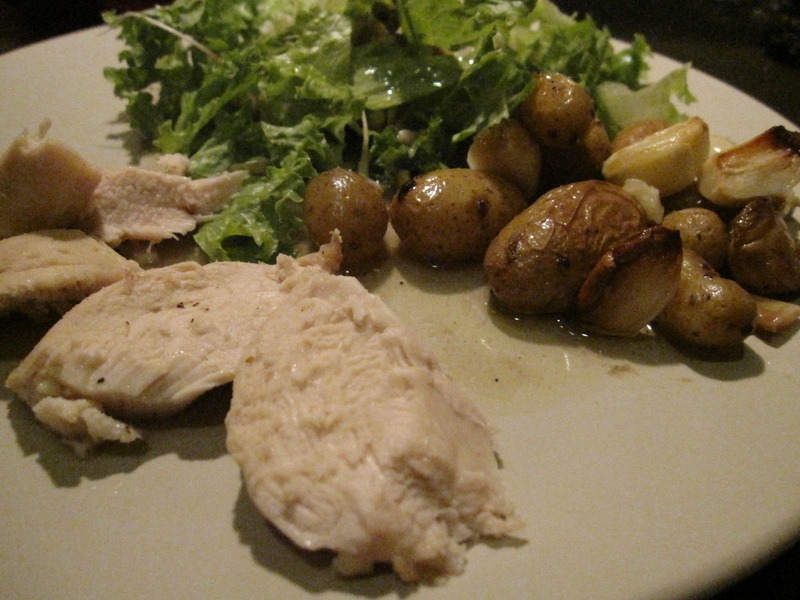 I think it is essential to cook potatoes, maybe other root vegetables also, with the chicken. The potatoes take on the flavor from the chicken, wine, and, of course, the garlic. So just add a side vegetable or a salad and your meal is complete. Rinse and clean chicken. Dry chicken- very important! (A dry chicken equals a crispy skin) Put chicken into a pan and season with salt and pepper. Lift up the skin of the chicken and place several small cloves of garlic between skin and breast. Clean and cut, if necessary, the potatoes. Combine potatoes and remaining garlic in a bowl to lightly dress with oil and season with salt and pepper. distribute potatoes and garlic around chicken. After chicken has been cooking for 30 minutes, toss potatoes and garlic, preventing burning. Add wine to pan. Cook chicken until it is done, approximately another 45 minutes. You can use a pop up or a manual thermometer test chicken’s doneness. Let chicken rest for 15 minutes before carving to serve. When slicing keep skin intact to show the softened garlic layered between the chicken breast and skin. Enjoy, and feel free to finish off the wine you opened for the chicken! I often cook with wine, sometimes I use it in cooking!!!!! I really enjoyed your take on the 40-clove classic. It was easy to approach and yet yielded stellar results. But you know me by now: I can never just leave well-enough alone! I had a pound and a half of fingerlings, so I needed not just a half cup of wine, but an additional half cup of chicken stock. I also tossed in a couple sprigs of fresh tarragon and thyme, scattered amongst the veggies. They provided just the right amount of perfume to my palate.